A keen athlete, Vicki discovered the benefits of a dancer’s workout over 10 years ago. She found that not only did it improve her own shape, muscle tone and flexibility beyond recognition, but that it increased her strength and stamina for other sports. In 2008, Vicki trained in the Lotte Berk Exercise Method and has since gained significant experience teaching classes on a group and private basis in a variety of locations across London, including at the Lotte Berk Studio, Fulham. With overwhelming demand for her classes, Vicki opened Barreworks Studio in Richmond in February 2010. In August 2010, Vicki trained and qualified as a fully licensed instructor of the New York City Ballet Workout. 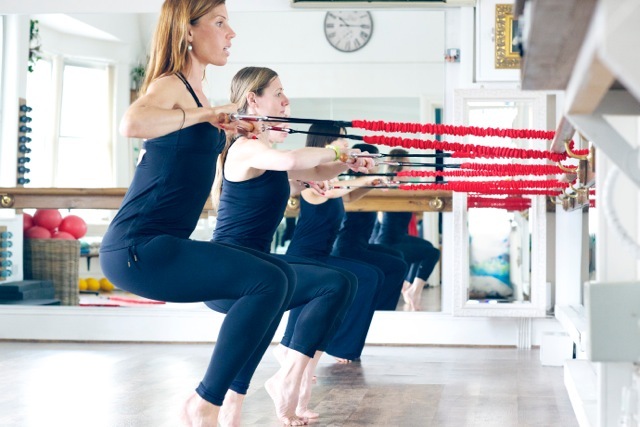 This highly-esteemed and world-renowned method has inspired the creation of the Barreworks Ballet Workout – an entirely unique programme incorporating aspects from standing barre, floor barre, deep core exercises and simple, choreographed movement combinations. Vicki’s theoretical learning includes the in-depth study of anatomy, physiology (including the specific physiology of stretching), study of the skeletal muscles, posture, core stability and pre and post natal exercise. Vicki has strong links in the well-established barre scene in New York and has completed advanced-level Instructor training with the founders of one of the biggest barre Studio networks in the U.S, Exhale.